With manufacturer plates. It looks like an A3. Probably a 2016. You can’t see them in the picture, but it has two exhaust pipes down on the left side. This is the only picture I could get. As soon as we cleared the intersection, he gunned it. I got along side it for a second at the next light, but he was in a turn lane and I couldn’t get a picture. 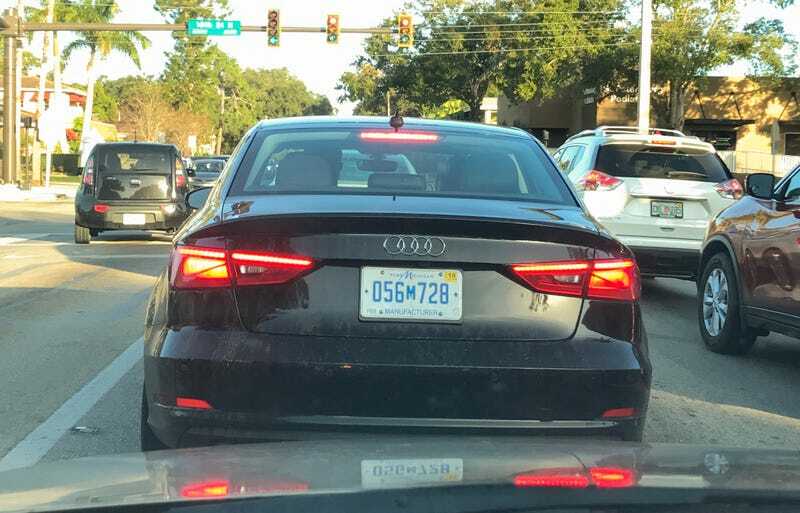 Up front, it had the Audi logo on the hood. In the space for the front license plate, there was a plate that said “Audi USA” or “Audi America” (I forget exactly which). No other badges, or even a hint that it ever had any other identification bolted to it. Any clue as to why it has no badge but has manufacturer plates? I find it odd because I saw that out of place camouflaged Q5 down here a while back. I spotted this in St. Petersburg, FL today. Twice! What’s Audi doing down here?